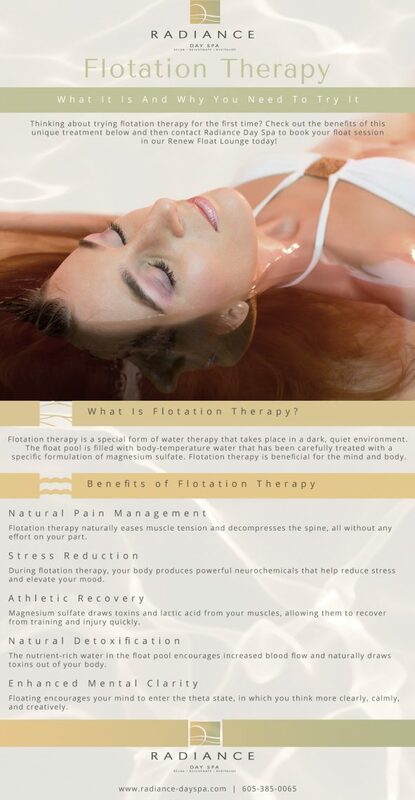 Have you heard of flotation therapy? This incredible treatment is growing in popularity across the world, and for good reason. In addition to providing you with unsurpassed levels of relaxation, flotation therapy often provides several other pleasing effects as well. In today’s post, we’ll take a closer look at this therapeutic spa treatment and a few of its more common benefits. 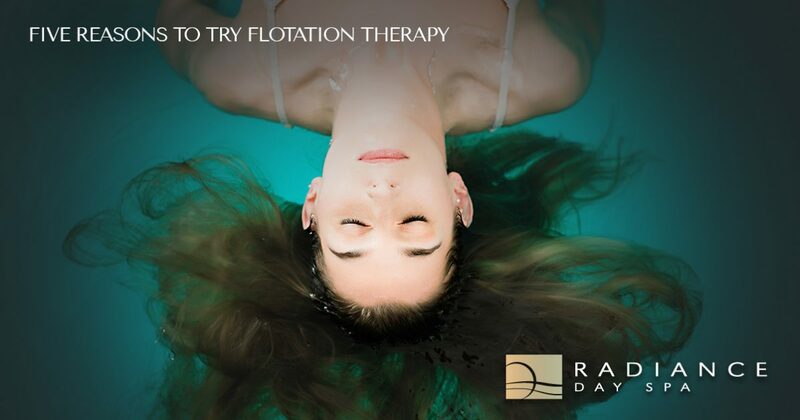 Read on to learn more and then contact Radiance Day Spa to book a float session in our Sioux Falls Renew Float Lounge today! Flotation therapy is a type of water therapy that is a powerful tool for achieving natural wellness. During a float session, you will enter a float pool that is filled with water that is the same temperature as your body. The pool is in a dark room and you will be given earplugs to provide you with complete silence. The water is treated with Epsom salt (magnesium sulfate), allowing you to float effortlessly during your hour-long session. The combination of salt, weightlessness, and the meditative state that floating induced is incredibly beneficial for the mind and body. If you suffer from a chronic pain condition, then you may have researched natural methods of pain relief. Studies have shown that flotation therapy naturally eases muscle tension and decompresses the spine, all without any effort on your part, making it an effective means of managing chronic pain naturally. Nothing is more relaxing than flotation therapy. As you float in quiet darkness, the sensory input that your brain receives in minimized. This provides your mind and body all of the energy they need to produce powerful neurochemicals, such as endorphins and serotonin, that are beneficial for reducing stress and elevating your mood. When you are training for an upcoming athletic event, flotation therapy can help your muscles recover quicker, allowing you to train harder with less downtime. This is because of the Epsom salts in the water. Magnesium sulfate draws toxins and lactic acid from your muscles, allowing them to heal as much as four times faster than they would have otherwise. Our bodies are exposed to toxins every day. Whether they come from beauty products or our environment, they can add up and leave you feeling lethargic and grumpy. The nutrient-rich infused water in the float pool encourages increased blood flow and naturally draws toxins out of your body, leaving your feeling incredibly renewed and refreshed. The neurochemicals that are released during a float session and the sensory deprivation that you’ll experience allow your mind to enter into the theta state. This is somewhat of a dreamlike state that allows you to experience enhanced mental clarity, increased levels of creativity, and a calming inner peace. Are you ready to experience the amazing benefits of flotation therapy for yourself? Relax, rejuvenate, and revitalize yourself in the Renew Float Lounge at Radiance Day Spa. Call 605-275-9535 to learn more about what to expect during this indulgent therapeutic spa treatment and book your appointment today!